Our Canine Love™ mission is to help pet parents keep their dogs and cats healthy, safe and happy. That mission extends to our philanthropic efforts too. We give back to the community by supporting pet welfare organizations and other initiatives that enhance the bond between pets and people and keep dogs and cats safe. Did you know that approximately 6.5 million companion animals enter animal shelters in the United States each year? We believe all animals deserve a love-filled life which is why we make a concentrated effort to support our local shelters and rescue groups. Last year, we donated more than $100,000 to support rescue and adoption, pet owner education and service animal programs. You can join us in supporting these important causes by clicking on one of the logos at the bottom of this page. You can also help support local pet programs by purchasing one of our Canine Love™ magnets, collars or leashes. A portion of the proceeds from each Canine Love™ product sold will go to support local pet rescue and adoption agencies. When fire strikes a family's home, pets are more likely than people to suffer severe smoke inhalation because they can't get out of the house without help. Sadly, more than 40,000 pets across the country die each year because first responders don't have the right equipment to resuscitate them. 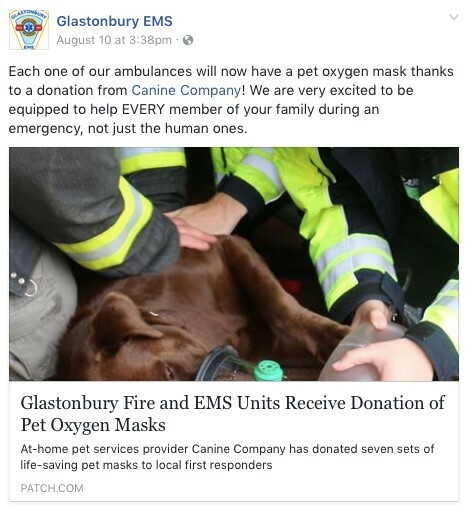 Our pet oxygen mask donation campaign was created to ensure that firefieghters and EMTs in the communities we serve have the life-saving equipment needed to resuscitate pets on-scene during an emergency. Here are comments from some of the first responders who have received them. And, our donations are saving pets' lives! Does your community have these life-saving masks? If not, tell your fire chief or emergency service director about our donation program. They can request one by writing to us at petmasks@caninecompany.com.